However, the vast majority of our progress has been in state-run prisons. In county- and city-run jails — where predatory contracts get little attention — instate phone calls can still cost $1 per minute, or more. Moreover, phone providers continue to extract additional profits by charging consumers hidden fees2 and are taking aggressive steps to limit competition in the industry. 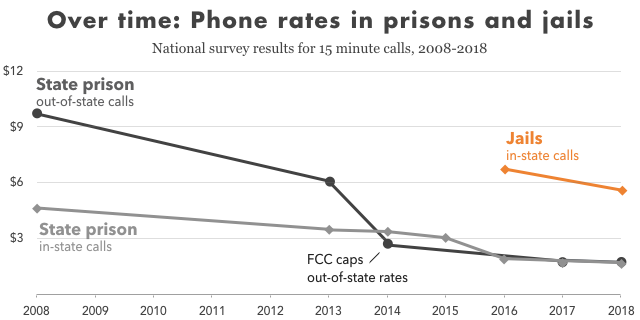 The cost of calls home from state prisons has declined as a result of the FCC’s caps and political pressure from the families, but jails still lag far behind. In fact, we estimate that approximately half of the small rate drop shown for jails is due to changes in data and methodology between the 2016 and 2018 surveys and may not reflect an actual drop in prices. (Shown are 6 national surveys of out-of-state calls from state prisons, 7 surveys of in-state calls from state prisons, and 2 surveys of in-state calls from jails. For more information about these surveys, see methodology). To see the states with the most significant rate drops, see Appendix Table 1. It is well within the power of both prisons and jails to negotiate for low phone rates for incarcerated people, by refusing to accept kickbacks (i.e. commissions) from the provider’s revenue and by striking harder bargains with the providers. And many state prisons have done so: Illinois prisons, notably, negotiated for phone calls costing less than a penny a minute. But in Illinois jails — which are run not by the state but by individual cities and counties — phone calls cost 52 times more, with a typical 15-minute call home from a jail in Illinois costing $7. In other states, the families of people in jail have to pay even more: A call from a Michigan jail costs about $12 on average, and can go as high as $22 for 15 minutes (compared to $2.40 from the state’s prison system). As of November 2018, in more than half of states, the highest in-state 15 minute call costs more than $10, and in 15 states it costs over $15. (Alaska, Connecticut, Delaware, Hawaii, Rhode Island, and Vermont do not have jails and are therefore not displayed). (For the names of the facilities that charge the most in each state, see Appendix Table 3. As of November 2018, in most states, the average in state call from jail costs more than $5. 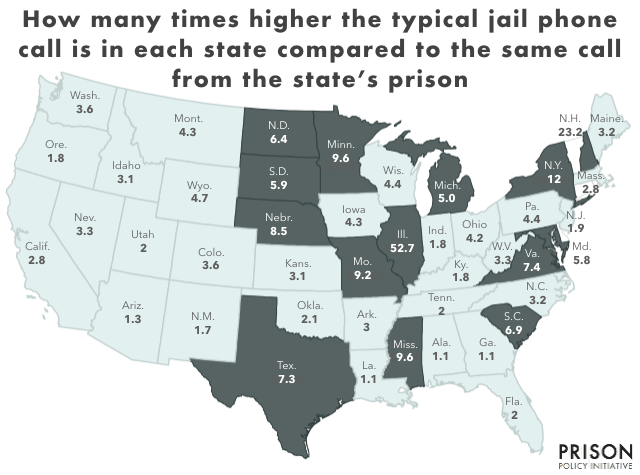 Many states with the lowest averages, such as New Mexico, Georgia, and Alabama, have laws and regulations that limit the cost of jail calls. Meanwhile, states like Arkansas that do not have laws or regulations capping the cost have average costs as high as $14.49 for 15 mninutes. As of November 2018, in most states, phone calls from jails are much more expensive than phone calls from prison. 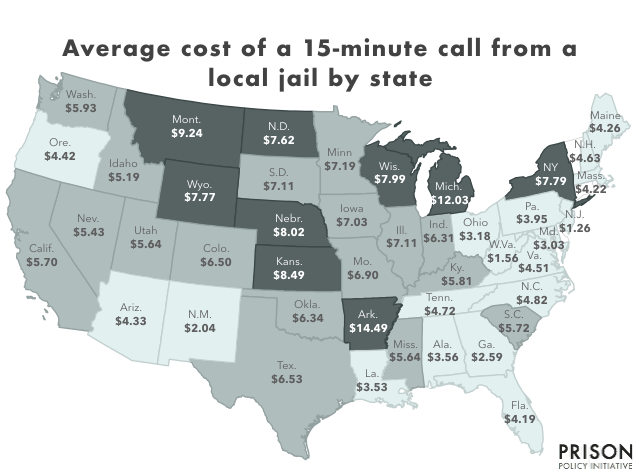 In 13 states, jails calls are at least 5 times more expensive. Why jails find exploitative contracts attractive — and how providers ultimately profit the most. The profit-seeking strategies of individual phone providers. We’ll review these issues in order. When the Federal Communications Commission reviewed confidential cost data from phone providers, it found that because jails are usually smaller than prisons and have higher turnover than prisons, providers pay more for certain overhead costs (such as the cost of opening new accounts), making each minute of use slightly more expensive. Local jails with a population over 1,000 14¢/minute About 31% of people in jails are in facilities of this size, and this rate is 27% higher than in state prisons. Local jails with a population of 350 to 999 16¢/minute About 32% of people in jails are in facilities of this size, and this rate is 45% higher than in state prisons. Local jails with a population under 350 22¢/minute About 37% of people in jails are in facilities of this size, and this rate is twice that in state prisons. It is clearly possible to have low rates in facilities of all sizes, as the vertical cluster of dots on the left of the graph illustrates. So if phone rates are not correlated with facility size, who is responsible for sky-high phone rates in jails: jail administrators or phone providers? Let’s start with jail administrators and their demand for kickbacks. As the FCC’s investigation found, facilities’ demand for commissions drives up prices. In order to win contracts, the providers are willing to charge any rate necessary in order to deliver the desired income. So a provider might offer to charge consumers $1/minute and pay the facility a 90% commission, or $0.50/minute with an 80% commission, or $0.10/minute with no commission at all. These combinations all deliver the same income to the provider ($0.10 per minute), but the end cost to the consumer ultimately depends on how large of a commission the facility demands. But while facilities play a role in driving up the cost of phone calls, it’s clear that the profit-seeking behaviors of individual providers have a much greater impact. Providers, it should be noted, do not have to charge exorbitant rates to deliver substantial revenue to facilities. Some providers offer a combination of high commission income and low rates per minute. But other providers, like Securus, continue to dominate the market despite offering facilities a worse deal: low commissions and high rates, as shown in this analysis of Michigan commission revenue and in-state phone rates. This analysis of annual revenue per incarcerated person5 shows that the most lucrative contracts are, from the perspective of the facilities, ICSolutions contracts that offer a lower rate. The facilities that contract with Securus and GTL often have both higher rates and a lower income. Methodology: This analysis is based on an average of available commission payments made between 2014 and 2017 (link to appendix), and designed as a more realistic view of how commissions actually work in practice. The commission percentages in the contract are misleading because the providers make profits on fees which are outside of the commission system, and the providers have been known to steer call volume to lower-commission call types in order to suppress commission payments. (As we’ve documented in Genesee County, Michigan, this can make commissions 8 times smaller than counties expect.) For the data, see the full report methodology. What accounts for these vast price disparities? Local jails are not significantly more expensive to serve than state prisons. Rather, phone providers have learned how to take advantage of the inherent weaknesses in how local jails, as opposed to state prisons, approach contracting. The result is that jails sign contracts with high rates that are particularly profitable for the providers. State prisons, which are larger than jails, have the means to analyze the costs and benefits of proposed contracts (and often write their own contracts). Their analyses can reveal hidden fiscal and policy costs underlying too-good-to-be-true vendor proposals. State prisons tend to be run by appointees of the Governor, so they are often insulated from short-term financial and political pressures, and are often supported by career staff who have years of experience negotiating with billion-dollar communications companies. County jails tend to be smaller,11 and unless they rely on expensive consultants, their staff will have a harder time negotiating sophisticated telecommunications contracts, and may even rely on language suggested by the providers. Local governments (which run jails) tend to have smaller or less flexible budgets and are less eager to think long-term than state governments (which run prisons). And in particular, when jails are run by elected officials, they may not be looking beyond the next election. The typical person booked into a jail is released in hours or days and may make only a few calls, so it is difficult for their families to put sustained political pressure on jail administrators to negotiate better contracts. Many state legislatures — and by extension the Public Utility Commissions and other regulatory and civil society organizations — pay very little attention to individual jails or the state’s aggregated jail policy. So to recap, the companies are savvy and very effective at cutting self-serving contracts with the jails. But in addition to their high rates in jails, companies also slip in hidden fees that exploit families and, as we will see, shortchange facilities. Phone providers are counting on facilities, regulators, legislators, journalists and the readers of this report to focus only on per-minute phone rates, ignoring their other major source of revenue: fees. This is what you pay per minute, including any higher charge for the first minute of the call. This is everything else you might pay for “services” related to the call, such as fees to open an account, have an account, fund an account, close an account, get a refund, receive a paper bill, etc. Sadly, the most unscrupulous providers have found ways to evade these new regulations, and continue to charge unconscionable fees. The fee charged by WesternUnion and MoneyGram to send $25 payments to each of the providers above from in-person agents in Massachusetts in December 2018 and January 2019. However, other companies have arranged18 hidden profits in these third party payment systems. For the same $25 payment to Amtel, Lattice or Securus, Western Union and MoneyGram charge a shocking $10-12. The explanation is that Western Union and MoneyGram are collecting a portion of this fee on behalf of the phone providers, something that the FCC intended to prohibit. Amtel has even admitted to the FCC that it receives a portion of Western Union’s fees. Western Union calls these payments a “revenue share” in its correspondence and a “referral fee” in its contracts. Families and facilities would be right to call this hidden fee a form of exploitation. The providers also invent new services which they call “advanced,” “premium” or “convenience,” but which tend to be simply more expensive ways to make families pay for the same product. For example, Securus goes out of its way to make it hard for family members to create and fund accounts in an efficient manner. Rather than encourage families to create pre-paid accounts — or to add funds to a depleted account — Securus instead steers people to pay for each call individually. 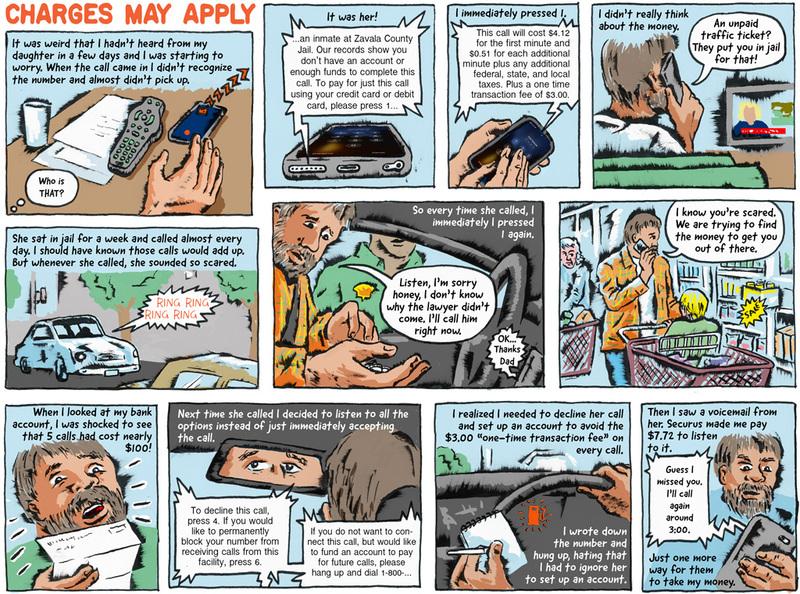 By emotionally manipulating family members into paying for single calls rather than creating accounts (see comic below), the companies drive up fee revenue.19 Other services — such as charging families to listen to voicemails from their loved ones in jail — similarly manipulate consumers and increase revenue from fees. Neither public safety nor consumer “convenience” benefit from these unnecessary but highly profitable call products. Phone providers, as we explain above, are skilled at writing self-serving contracts that burden consumers with unfair rates and fees. It is therefore in the interest of correctional facilities to be careful and conscientious in selecting a phone contract. But the odds of negotiating a fair contract — odds already tilted against facilities, as we’ve shown — are declining as phone companies buy up their direct competitors and the providers of related correctional services. 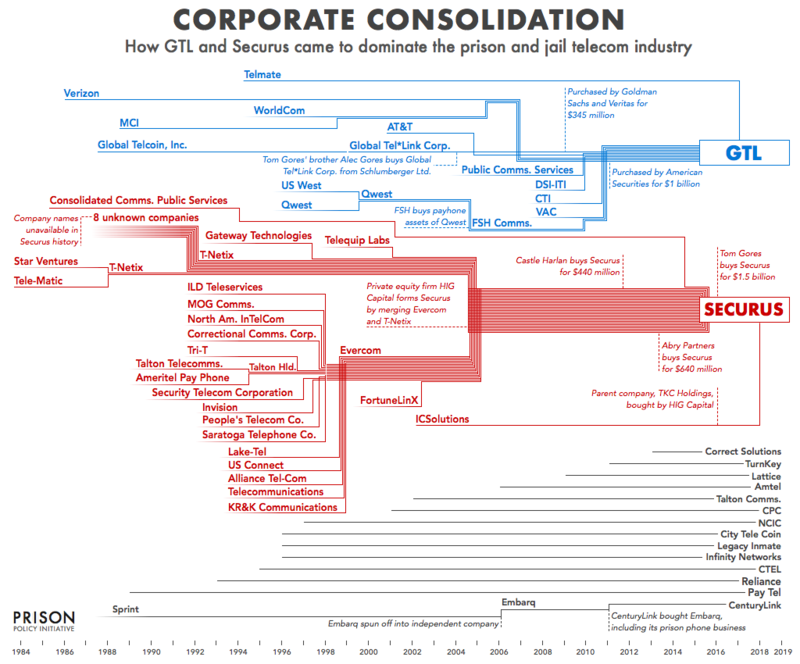 The fact that only two companies now control most of the correctional phone market — and are poised to control even more if Securus acquires ICSolutions — is bad news for both facilities and consumers. But the dominant companies have a second monopoly strategy, which is both more subtle and more harmful: buying non-telephone companies, in order to offer facilities packages of unrelated services in one huge bundled contract. Bundled contracts combine phone calls with other services, such as video calling technology, electronic tablets, and money transfer for commissary accounts. This allows providers to shift profits from one service to another, thereby hiding the real costs of each service from the facility. Bundling also “locks in” contracts for the provider: It makes it more difficult for the facility to change vendors in the future, because the facility must now change their phone, email, commissary, and banking systems all at the same time. So even the savviest of facilities are undercutting their future power by signing risky bundled contracts. Prohibit commission payments in all of their forms. Consider making phone calls free. In July 2018, New York City went further than prohibiting a commission and pledged to make phone calls free. This saves the poorest families critical funds, is a cost-effective investment in lowering recidivism, makes the justice process fairer and, because it reduces all of the hassle associated with accounts and billing, may not cost very much. Refuse to consider contracts that bundle telephone service with other goods and services. Facilities should always know what they are getting and what they — and the families — are paying for. Regularly conduct realistic tests of how your provider charges and treats consumers. Such tests should include test phone calls to staff phone numbers not already in the provider’s system and should include test deposits made via the mechanisms most likely to be used by the families of incarcerated people, including WesternUnion and MoneyGram. If you discover your provider is charging consumers beyond the fees and rates disclosed in your contract, demand that the provider make refunds. Amtel, Lattice and Securus should stop making a profit on WesternUnion and MoneyGram payment fees. The consumers that use these services are among the lowest-income people in the country and should not be a target for exploitation. All providers should explore and promote alternative and lower-cost ways for low-income consumers — their target demographic — to pay for services. In particular, their customers who do not have bank accounts or credit/debit cards often pay the providers via WesternUnion or MoneyGram, which offer a network of retail locations to take cash to pay bills, but services like PayNearMe22 can provide the same functionality at a much lower cost. During the request for proposals process, be honest with the facilities that high-rate/high-commission contracts are not in the facility’s best interests. Explain that low-rate/low-commission contracts produce comparable revenue for the facilities while increasing family contact. Follow the lead of Alabama and craft comprehensive regulation of the prison and jail telephone industry operating in your state. If your state statutes do not grant you sufficient regulatory authority over the industry, immediately go to the legislature and request it so that consumers and facilities in your state will not remain defenseless. Require these correctional communications contracts be negotiated on the basis of the lowest price to the consumer. (This goes beyond setting a cap or banning “commissions.”) Ensure that these rules apply to both prisons and jails. Alternatively, consider establishing a system that sets a maximum commission amount on a per minute basis — at for example 1 cents a minute — in order to give jails an economic incentive to both increase call volume and keep the total cost to consumer low now and in the future. 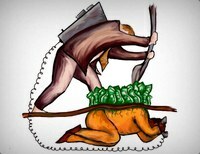 Require the state prison system to negotiate its contract to give county jails the option to opt in to the state contract and its terms.23 Depending on the number of counties in a state and the resources of each county; this could be a powerful way to reduce a burden on county jails while lowering the cost to families. Encourage the State Public Utility Commission to investigate and regulate the prison and jail telephone industry. Be on the lookout for arguments from providers that they are exempt from regulation because they claim to be providing Voice Over Internet Protocol (VOIP) or Internet Protocol-enabled (IP-enabled) services. (Some states deregulated these services when cable telephone markets became competitive, but such reregulation should not apply in a quintessential monopoly such as prison and jail phone service.) Depending on your state, you may want to encourage your Public Utility Commission to reject such arguments as contrary to legislative intent, or you may need to pass clarifying legislation. Reject Securus’ application to merge with ICSolutions. Investigate Amtel, Lattice and Securus for arranging a kickback with WesternUnion and MoneyGram in violation of the FCC’s order prohibiting marking up those money transfer fees. Pass legislation like the last Congress’ S. 2520 Inmate Calling Technical Corrections Act which would clarify the FCC’s authority to regulate both in-state and out-of-state calls, fees, and advanced technology like video calling. Drops in instate state prison rates over the last decade. How rates compare between urban and rural counties, with national data and graphs for California, Colorado, Illinois, Iowa, and Ohio. Exhibit 3: Amended Contract between Amtel (dba ATN) and Western Union, 2015 showing that in Alabama, Amtel will no longer be receiving a “referral fee” from Western Union. 2013 prisons: Prison Legal News surveyed rates in 2012-2013. This survey is based on pre-paid rates, which was, by this time, the most common type of call from prisons and jails. For the out-of-state rates in 2014, we adjusted the 2013 survey data discussed above to make all states compliant with the new FCC out-of-state rate caps that went into effect in February 2014, limiting the cost of an out-of-state 15-minute call to $3.15. If states’ interstate caps were already below $3.15, we assumed their rates remained the same. Although we do not recall any instances of this, it is possible that some states may have taken the opportunity to immediately lower rates more than was required, and it is possible that our average of $2.80 is a slight overestimate. 2017 prisons: For 2017 in- and out-of-state rates, we used historical prepaid rate data available at prisonphonejustice.org. Each state page provides phone rates from previous years. For example, Maryland’s historical data can be found on this page: https://www.prisonphonejustice.org/state/MD/history/. 2018 prisons: We manually looked up prepaid rates26 on providers’ websites for both intrastate and interstate calls in October of 2018. For intrastate calls, we got a rate quote for a phone call to each state’s governor’s office, consistent with the 2016 survey methodology, and for out-of-state calls we used an out-of-state number. 2018 jails (in-state calls only): We manually looked up prepaid rates on providers’ websites November 1st 2018 to November 8th 2018 from an in-state number (generally the governor’s number) for each facility listed in the state. (This methodology may have understated the cost of in-state phone calls in a small number of counties if the facility was within the same “LATA” as the Governor’s office. In those cases, our rates may report a lower “local” call rate and not a typical in-state call; but we did not have a way to control for this directly except in Michigan where we manually chose a number located in another “LATA”). As in 2017, counties that had multiple facilities were aggregated together, state prisons were kept separate from our data on jails, and we removed police departments. Some facilities are included twice because providers sometimes do not remove the rates/counties from contracts they have lost from their website. If we were unable to determine which provider currently contracts with a facility, we kept both. There are some slight differences in these surveys that are relevant to discuss. First, although more comprehensive than our 2016 data, this new survey is still missing data from several smaller prison phone companies that do not post their rates online, including Correct Solutions, City TeleCoin, Turnkey, Consolidated Telecom, Inc. (CTEL), etc. Second, some counties are in one survey but not the other, likely because they changed to or from a provider who does not post rates. Third, our newer survey includes two-lower cost providers that were not in the earlier survey. (Telmate’s decision to finally post their rates online and NCIC’s sharing of their rate data with us slightly reduces the average rates reported. Based on our analysis of counties for whom rates are available for both years, we believe that about half of the $1 decline in the cost of in-state 15 minute phone calls from 2016 to 2018 is the result of actual declines in the rates; and about half is the result of these two lower-cost providers making their data available. For our survey of WesternUnion and Moneygram fees, we collected Western Union fee data for a $25 payment to different phone providers through in-person payments at Big E’s Supermarket, Easthampton, and Walgreens (225R King St., Northampton, MA) and through online chats with Western Union Representatives. We collected data on MoneyGram’s fees for a $25 payment through Moneygram’s online BillPay feature and in person at Walmart (337 Russell St, Hadley, MA 01035). Our interactive feature showing how much a phone call from various local jails would cost is based on our late 2018 survey of jail rates. The feature includes only some of the highest rates from jails in each state, so for the specific rates of all facilities, see appendix 2. The feature always shows the cost of the first minute of a call for the first minute of reading the webpage, and then apportions the cost of subsequent minutes to each subsequent second. For providers who bill only on the basis of individual minutes, our feature therefore underestimates the cost of each call. Our timeline of consolidation in the industry is built upon reviewing every document we could find and a select number of interviews. The raw data and our notes on sourcing for transaction or change in status is in Appendix 7. Where ever possible, all dates in the visual are accurate to the nearest quarter year. Because it was not always clear when these privately held companies were founded or when they entered the prison or jail phone market, we choose to represent start dates that we were not sure about with a faded line. We used a break in the line to represent companies’ name changes. We did not include some very small companies, such as Michigan Paytel and American Phone Systems, some of which appeared to have substantial business relationships with large phone companies. For the sidebar about unjustifiably high phone rates from jails, we used commission data for 2014-2017 for select counties in Michigan, which was collected via FOIA requests. With a goal of representing a range of counties, we requested records from at least 54 counties (out of 83 total) and received records from 44. This raw data is available in Appendix 5. To reduce the impact of artifacts in the data and to make it possible to compare counties of different sizes, we averaged the payments from multiple years and used the Average Daily Population reported in the Census of Jails, 2013 to calculate annual revenue per incarcerated person. We calculated the annual fee savings from reducing credit card deposit fees from as much as $9 per deposit to $3 per deposit by estimating the number of deposits made by the major providers and apportioning that to their share of the market. For GTL: According to data GTL submitted to the FCC in 2014, GTL processed 11,408,021 credit card transaction fees. GTL reported charging between $2.00 and $9.00 per credit card transaction, and while we believe that most of those charges were at the high end; we made the conservative assumption that the typical GTL fee was the average of those two figures, or $5.50 per deposit. The FCC’s order thereby saves consumers $2.50 for each of the 11.4 million deposits made in a year at GTL facilities, for a savings of $28.5 million. For Securus: Securus did not submit public-use information to the FCC that would allow a similar analysis. However, we know that at the time, Securus’ marketshare was about 1/3rd of GTL’s — Securus has an estimated 15.0% - 19.4% of the market (compared to GTL’s 46.0% - 52.9% - so we therefore estimated that Securus had 3,968,007 transactions in 2014. Securus’ credit card processing fee was $7.95, so reducing the fee to $3 would save $3.95 almost 4 million times a year for a savings of $19.6 million. This report requests your location so that we can show the rates of phone calls in jails in your state. If you gave us this permission, we discarded your location data as the page finished loading. If you did not give us this permission — or if your browser was configured to decline permission automatically — this report simply makes an educated but unrecorded guess based on your IP address about what state’s data you will find most relevant. All Prison Policy Initiative reports are collaborative endeavors, and this report is no different, building on an entire movement’s worth of research and strategy. For this report, we wish to single out the contributions of illustrator Kevin Pyle for explaining two of the industry’s dirtiest and most complicated tricks in two comics, as well as Robert Machuga, Jordan Miner and Mack Finkel for their assistance with design and interactive functions. We also wish to acknowledge the editors at The Verge, who (in the excellent 2016 article Criminal Charges) gave us the inspiration for the phone rate clock in this report. We are also grateful to the many colleagues who helped us gather rate data, pointed us to documents on the history of companies in the prison and jail telephone industry, or reviewed drafts. The Prison Policy Initiative’s Communications Strategist, Wanda Bertram, provided invaluable feedback and editorial guidance. We also have to thank our individual donors, who choose to invest in research that gives voice to the 2.3 million Americans behind bars, and who make reports like this one possible. Peter Wagner is an attorney and the Executive Director of the Prison Policy Initiative. He co-founded the Prison Policy Initiative in 2001 in order to spark a national discussion about the broader harms of mass incarceration. He is a co-author of a landmark report on the dysfunction in the prison and jail phone market, Please Deposit All of Your Money, and has testified in partnership with the Wright petitioners before the FCC in support of stronger market regulations. His other work includes the annual Mass Incarceration: The Whole Pie, Following the Money of Mass Incarceration, groundbreaking research on the racial geography of mass incarceration, and reports putting each state’s overuse of incarceration into the national and international context. He is @PWPolicy on Twitter. Alexi Jones is a Policy Analyst at the Prison Policy Initiative and a graduate of Wesleyan University, where she worked as a tutor through Wesleyan’s Center for Prison Education. In Boston, she continued working as a tutor in a women’s prison through the Petey Greene Program. Before joining the Prison Policy Initiative in 2018, Alexi conducted research related to health policy, neuroscience, and public health. Her most recent publication is Correctional Control 2018: Incarceration and supervision by state (December 2018).